Are you tired of using headphones to enjoy music on your smartphone, tablet or other mobile device? 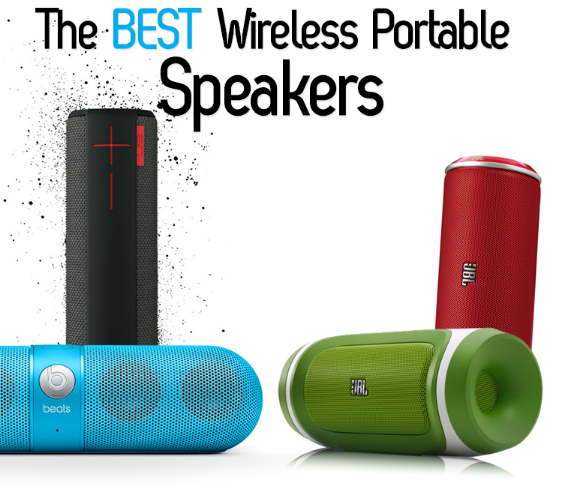 With a set of the best portable speakers, you can do away with that problem once and for all. Portable speaker technology has advanced dramatically in recent years, as evidenced by the ready availability of features like Bluetooth connectivity and amazing audio output. At the same time, prices have plummeted, so it’s no longer necessary to spend a small fortune to take advantage of these convenient accessories. Having the best possible sound when you listen to music, watch movies, or are listening to someone talk on a phonarce is very important. It also stands to reason that the quality of the sound should be as perfect as you can get it. The Bose SoundLink Mini Bluetooth Speaker does just the thing and is small and portable enough to be carried virtually anywhere. After all, Bose is one of the leading manufacturers in sound technology. With this product you will not be limited to sitting in one spot like you have been with other speakers. This is completely mobile and won’t cause you any trouble to carry it around with you. The battery in this item also lasts for up to seven hours, which is great if you are going on a road trip or perhaps needing music while at work. The crystal clear sound that comes from the speaker is also not affected if the battery is low, but you won’t have to worry about running out of power because the Bose Soundlink Mini Bluetooth Speaker is rechargeable. It can also connect to your Bluetooth device so you can stream whatever you want from your phone or other item directly to the speaker. The SOL Republic DECK is the essential party speaker. It delivers heart pumping 360 wall of crystal clear music. For outdoor gatherings, try the Outdoor Mode which amplifies the sound to drown out background noises. This speaker is unlike the others as it provides up to 300 ft of range! Your party may not last all night, but your SOL Republic DECK will. This powerful deck provides up to 10 hours of continuous play when fully charged. Heist mode allows up to 5 devices to link and take turns sharing their music so your friends can share their music as well. Just tap and pair. If your friend has an older model phone or music player no problem, the SOL Republic DECK is still compatible. Simply plug the device in by stereo jack and they can still join in. The SOL Republic DECK is not just for entertaining. Use it as a hands free speakerphone for the whole family to join in the conversation. Use it while working in the home or lawn. So whether you are having a get together or just enjoying some time at the house, the SOL Republic DECK is a must have for any home. 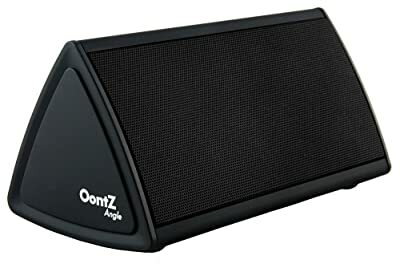 Not only is the OontZ Angle Ultra-Portable Wireless Bluetooth Speaker very helpful for listening to all of your music, it is also shaped in a very attractive and geometric way! This is one of the most interesting speakers simply because it features a triangular shape with slightly indented features on one side that house the actual speaker pieces. It has also been shown to offer a much better quality of sound than other products of a like design such as Beats Pill and The Jambox, and it beats their prices in fairness to the consumer too. Cambridge Soundworks offers this product for people who want to be able to listen to their iPhone, MacBook, iPad, iPod, Galaxy and countless other devices. This product also connects to Bluetooth so that you don’t have to have it plugged in to enjoy the sound. 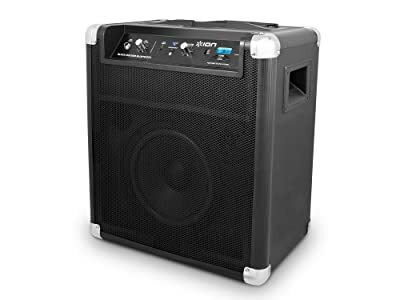 The battery itself weighs an amazing 9 ounces and features a lifespan of up to 10 hours, is rechargeable, and provides excellent sound for parties, games, and all types of other things. Two of the main attractions of this item are that the bass pumps out of it well when compared to other items of its kind, and the wireless connectivity of it is second to none when it comes to ease of access. Photive’s CYREN Bluetooth speaker is available in more than just one color, but the black will match almost any style or decor. The modern design doesn’t even look like a speaker, and it’ll work especially well in homes and offices with a contemporary feel. CYREN takes up only a few inches of space. Thanks to Bluetooth, the CYREN speaker is completely wireless. The only wire you need is the micro USB cable for charging, so you can use the same cable that you would use for your smartphone or tablet. However, you can use it with any audio source with a standard 3.5 mm jack. The speaker comes with its own auxiliary cable. Photive advertises up to ten hours of playback time when using the aux cable, and this time decreases slightly to eight hours when playing via Bluetooth. You may see a slightly shorter battery life, however. The CYREN speakers uses the most recent version of Bluetooth, so you’ve got a range up to 33 feet before you experience quality issues. Setup is easy because there’s no codes to pair this with your iPod or smartphone. With the latter, you have the option to use the microphone to answer calls, which is convenient. No matter the color product you get when you buy the HDMX Audio HX-p230BL JAM Classic Bluetooth Wireless Speaker, you are going to be getting a superior product that will make listening to music much more enjoyable. One of the most popular colors of this item is the blueberry color. A good feature of this item is the easy to use play/pause button and the volume changing buttons in the front. They are large enough to be pressed without having to spend extra time locating them, and are not hidden underneath or in back of the speaker like many items. The small footprint of the area which this speaker allows sound to flow is great because it supercharges the music so you can hear every detail clearly. You can have four hours of wireless play when you fully charge it, and will find that it is compatible with most items you’ll use that have Bluetooth from up to 30 feet away. The item itself only weighs about 9.6 ounces and includes a powerful lithium-ion battery. Some of the other popular colors this product comes in are apple, apricot, blackberry, grape, and strawberry. This gives the item a bit more flair than other types of speakers. Enjoy superior sound from Bose! 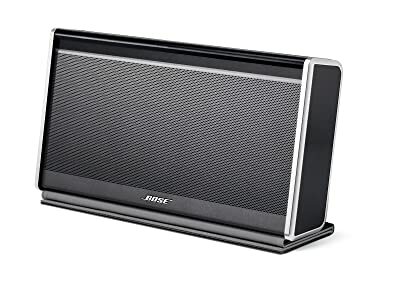 Broadcast your music from any Bluetooth compatible device with the Advanced Audio performance you have come to expect from Bose using the Bose SoundLink Bluetooth Mobile speaker II. With a battery life of up to 8 glorious hours, the SoundLink speaker works wirelessly up to 30 feet to broadcast your music from your phone, tablet, laptop, or other portable device. Input is also possible via direct connection to the 3.5 mm auxiliary input or micro SD ports on the speaker. High marks are well-deserved for the Bose SoundLink Bluetooth Mobile Speaker II. The product works as described and produces excellent quality sound. Setup is a breeze, and managing playlists and input is done directly from your source device. Power and volume controls are on the speaker with a 2.9 pound compact design measuring 5.1 inches (13.0 cm) high by 9.6 inches (24.4 cm) wide and an unobtrusive 1.9 inch (4.8 cm) depth. The speaker comes with wall charger and nylon bi-fold cover and is available in several beautiful finishes. In todays’ market, there are many wireless speaker products that are offered, just compared to a few years ago when the pickings were slim. The Creative D100 Wireless Bluetooth speakers are a great choice for the smart shopper, while still offering a high quality sound at a reasonable price. Its lightweight design makes its extremely portable, which eliminates the need for huge bulky stereo systems. It also makes a great choice for outdoor use whether in your backyard or at the beach. So if you’re in the market for an affordable, quality wireless speaker alternative, than The Creative D100 Wireless Bluetooth speakers are definitely an option worth considering. 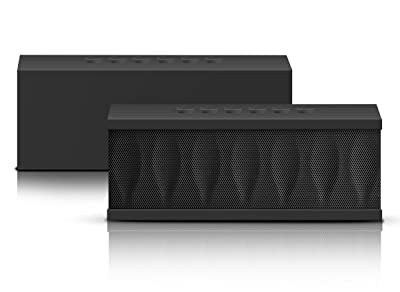 One great thing about the Jawbone BIG JAMBOX Wireless Bluetooth Speaker is that it does not look like a traditional speaker, and the color designs are great such as the Graphite color as well as the way that the speaker itself resembles a stone in color and texture. 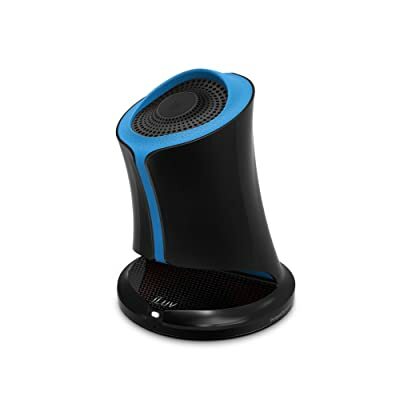 This speaker acts as a wireless speaker and a speakerphone, giving it a dual purpose. It also includes a lithium-ion battery that is rechargeable with up to 15 hours of battery life. This is on only a single full charge, which gives it a longer duration of useability when compared to other speakers. Weighing in at around 2 and a half pounds, this is not a small speaker that you can carry in your pocket. However, it is small enough to be carried in a bag if needed without having to worry about it being too bulky. It is compact enough to be moved from room to room with ease and features high definition sound that can fill an entire room, as well as surrounding rooms. One excellent feature of the JAWBONE is that you can update it and load content from the website that creates it in order to maximize its usefulness. Being able to use a portable wireless speaker with your Bluetooth is always going to be beneficial. This is why the JBL Charge Portable Wireless Bluetooth Speaker is so wonderful. This item comes in an oval shape with a hard mesh speaker area that resists damage from being hit or dropped, which is particularly good at parties. It also comes in multiple colors such as gray, green, blue, and black. The handy carrying case that it comes with also keeps it from being exposed to the air or any moisture hen not in use. The built in 6000mh lithium-ion battery will provide you with around 12 hours of non stop playing without having to stop and charge it during that time. This is excellent for parties or if you bring the speaker to work. It also streams stereo music from almost any type of wireless Bluetooth device. One of the best things about this speaker is that it helps to deliver extremely good bass for anybody needing any extra thump when they are listening to it. The battery is also rechargeable so you never have to worry about buying new batteries, and can be used to recharge certain mobile devices, giving it many different uses for the home or office. The ability to use Bluetooth connected devices with a headset or earpiece is very important for people who want to be able to have the best possible sound without losing out on the quality of that sound. The JBL Micro Wireless Bluetooth Speaker is just the thing for a person who wants a great speaker that won’t distort sound. As with any product, however, there are good things and bad things about this item, but with this speaker the good far outweighs the bad. This speaker is attractive and sleek without being bulky or hard to manage, and you can bring it with you without any problem if you need to go somewhere. The good thing about this speaker is that it is compact and only about the size of a hockey puck. This can fit into a purse, bag, or even a pocket on a jacket with no problem. The battery inside of the product is built in rather than bought separately, and ion-lithium one that works great and can be recharged, and the device also comes with a cable hidden in the bottom to plug into a larger device. However, be aware that really heavy bass from music might not carry over into this product. The Kinivo ZX100 is a small portable speaker that fits in the side pocket of a backpack or purse. Low-frequency output is provided by Expansive Resonator Construction Design (ERDC). The built in audio cable has a 3.5 mm connector. 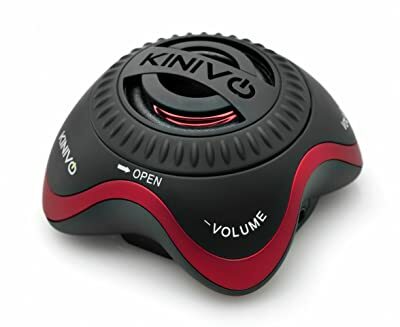 The Kinivo ZX100 is compatible with iPod, iPhone, any MP3 player, CD players and laptops — really with any device that has 3.5mm audio socket. An internal rechargeable battery provides up to 6 hours. A USB charging cord is included. The device comes in several colors including green and white, weighs just under one pound. Its dimensions are 5.8 x 4.9 x 2.4 inches. This powerful little speaker is one of the best portable speakers available. It is compatible with a long list of devices including iPads, Android smartphones, Blackberry smartphones, and tablets. It is simple to use. The speaker starts at half of its volume capacity and and is easily increased. Twist the top of this impressive round mini speaker, plug it into your device and start enjoying fantastic sound! Enjoy music at a desk, in a hotel room, or share a tune with friends anytime anywhere. The sound is amazingly robust and clear. The X-Mini II is an ultra-portable speaker designed to deliver great sound in a small package. The X-Mini II is able to be connected to any mobile phone, MP3 player or computer and it delivers top-notch sound while being able to be put in a pocket. The X-Mini comes in a variety of colors (around 9) to match anyone’s personality or need. A new feature exclusive to the X-Mini II is the ability to connect other X-Minis together to allow for a more immersive and powerful listening experience. The device has one full range 40mm driver/sub-woofer with an integrated amplifier. Connectivity is the average 3.5mm audio line and the device is able to be charged with a standard USB cord. The X-Mini II has several buttons included on the device like a volume knob and power switch. The built-in rechargeable battery is rated at 400mAH and generally lasts around 12 hours. The X-Mini II is a phenomenal speaker for its size. The sound is loud and clear even when cranked up to its full volume. The build quality is very nice, and having a rechargeable battery is super convenient. Overall, the speakers are very stylish and a great addition to anyone with a netbook and laptop. The iHome Color-Changing Portable Speaker is the perfect addition to any portable media ensemble. At only 3.2 oz., this tiny speaker’s vacuum bass design will deliver a rich and full sound, including and enhancing the bass range, in a small form that fits in the palm of your hand. Your auditory experience is accompanied by an LCD light within the speaker that changes between four colors: blue, green, amber, and red. The internal lithium ion battery can be recharged via USB, and will deliver hours of listening. The included 2-in-1 cable connects your speaker to your 3.5 mm audio port, for virtually any electronic audio device, as well as to your USB port for charging. 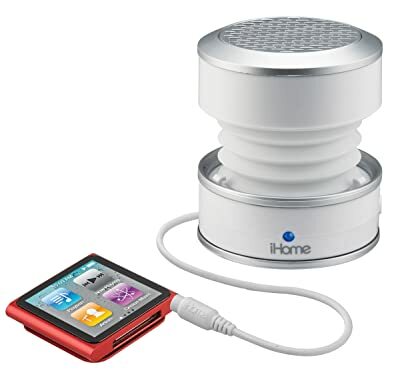 The convenience and versatility of the iHome Color-Changing Portable Speaker will add character and portability to your system, giving you the freedom to go where you want, with a full sound to back it all up. 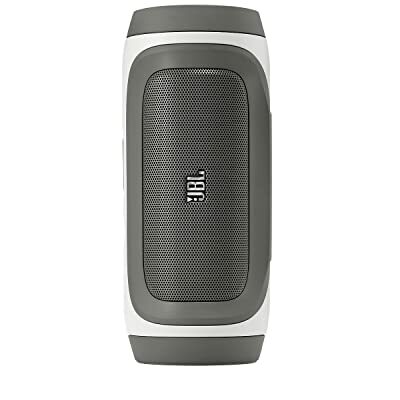 The JBL Flip is a portable stereo system ideal for those looking for a way to take their music on the go. Light weight and portable, it can be taken almost anywhere. Equipped with Bluetooth technology the JBL Flip easily connects wirelessly to compatible smartphones and tablets. For those devices that are not Bluetooth enable the JBL Flip can be plugged in directly. This stereo system is equipped with two 1 5/8 inch drivers for optimal sound. The built-in bass port generates bass at a superior level to comparable speakers. The JBL flip also contain a microphone and call-answer button that allows you to use the speakers for phone calls as well as music. This feature is great for those looking to hold conference calls or meetings and want a sound clarity beyond what a traditional speakerphone offers. 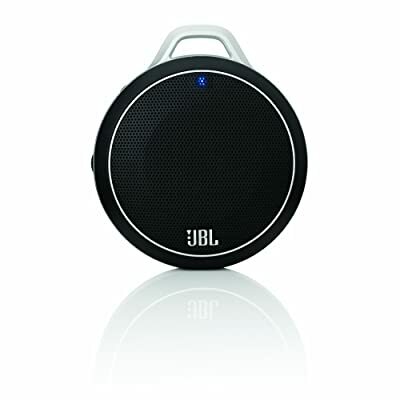 With a rechargeable Li-ion battery the JBL Flip provides for up to five hours of play time. 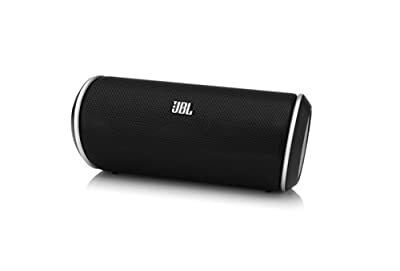 The JBL flip is an excellent option for those looking for a reasonable priced and easily portable stereo system that offers high quality sound. 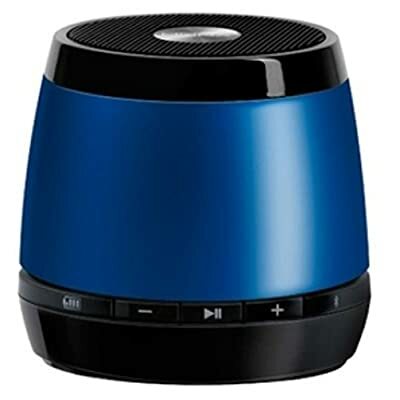 The Gogroove SonaVERSE BX Rechargeable Stereo Speaker System is a small, cube shaped speaker with great stereo sound. It’s versatile, so you can can enjoy quality sound anywhere. It works with all of your devices such as your laptop, tablet, iPod, DVD player, MP3 player, and smart phones. You can enjoy music previously saved on a flash drive. You can also play music from an SD card or a micro SD card, up to 16 GB. When you turn it on, it remembers the last song played and starts playing the next one. The SonaVERSE is 5″x 4.25″x 4″ and weighs about two pounds. It has a seven hour rechargeable Lithium-Ion battery and a 3.5mm AUX port. It has two stereo drivers which produce great stereo sound even when it’s turned up loud, and it delivers from 6W RMS-12W peak. People have called the Gogroove SonaVERSE BX amazing and insane. They also say they were blown away, it rocks and that it smokes all the others. Reviews have stated that the sound quality is excellent, the dynamic range is good, and it has great base sound. Some customers say that they would definitely recommend it and others say buy it. 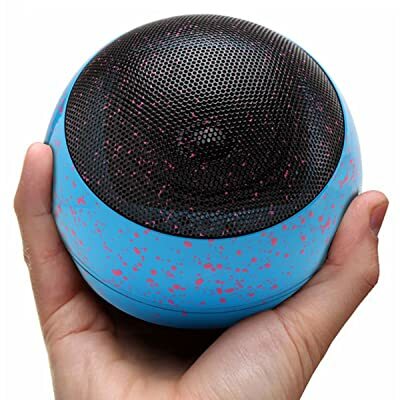 The GOgroove BlueSYNC OR3 Portable Wireless POWERFUL Bluetooth 4.0 Paint Splatter Speaker System is compact and conveniently can be used just about anywhere such as the beach, hiking, dorm room, or a party in the backyard. With it’s easy-to-use and convenient technology, the OR3 makes pairing and streaming wireless music effortless up to 30 feet away from your source. Another valuable benefit to the speaker system is the onboard controls. Syncing is as simple as holding down the sync button. It is easy to call and answer the phone with the built-in microphone and allows you to use the OR3 as a speakerphone. For high-fidelity, the system utilizes the bluetooth v4.0+EDR with A2DP and AVRCP for the crisp sound quality. Featuring the rechargeable battery, the OR3 gives the listener the up to 16 hours of listening time. 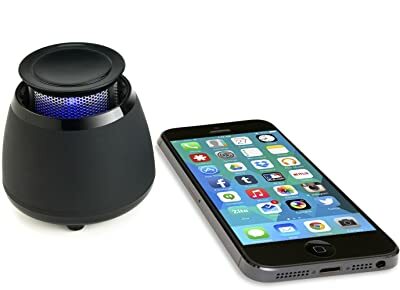 The GOgroove BlueSYNC OR3 Portable Wireless POWERFUL Bluetooth 4.0 Paint Splatter Speaker System is compatible with most tablets, laptops and smart phones. It also comes in several colors such as green, blue, black and white. 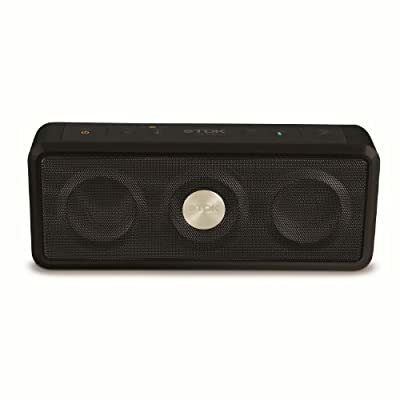 The Ultimate Ears Boom Wireless Bluetooth Speaker, has proven to possess high quality performance while allowing smart phone, tablet and computer users the ability to experience this amazing speaker. Although, this speaker is considered to be small in measurements (7.2 cylinder, 2.5 diameter, and 1.2 pounds) the Bluetooth speaker’s sound is considered to be more powerful than the Logitech UE Mobile Boombox. Do not be fooled by its size because this amazing can get relativity loud. The Ultimate Ears Boom Wireless Bluetooth Speaker also offers the ability to be paired up with another speaker allowing users to obtain stereo experience. 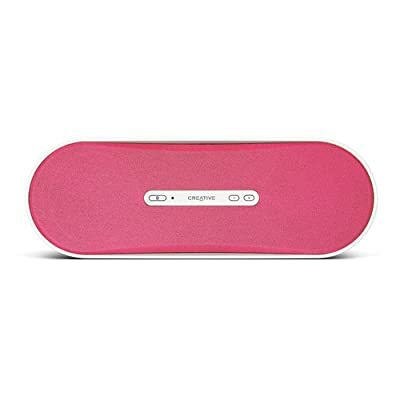 The Ultimate Ears Boom Wireless Bluetooth Speaker is water proof, stain resistant and comes in multiple color combinations including a white rubber and red mesh version. 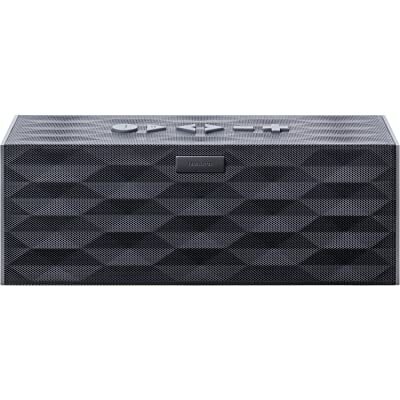 The Wireless Bluetooth Speaker, also offers large volume controls located on one side while the power button site on the other same side as the d-ring. The d-ring can be utilized by a string or S hook to allow the speaker to be hung as a lantern or just for decoration purposes. The wireless Bluetooth speaker also comes with a long lasting battery that is not only rechargeable but can last up to 15 hours. One nice thing about this particular speaker is that it is portable enough to bring anywhere you go. With a weight of only 8.5 ounces, this item from Gadget Hunter is a great way to get the most out of any music you listen to. You can also use it to watch movies, play games, and stream music at parties. This speaker is compatible with many items such as laptops, desktops, iPads, and most MP3 players. The color it comes in is black, but that doesn’t detract from it at all as many electronics feature black outer casings. This speaker also comes with a handy carrying bag that is splash proof, a USB charging cable, and an 80cm audio extension cable. The rechargeable battery on the Rokono Bass+ has an extended life of 10 hours making it good in a variety of situations. It also has a crystal clear resonance for both bass and also carries higher tones throughout the area as well. A unique fact about this particular speaker is that you can easily link multiple types of the same item together to create an impressive sound base. The Creative Airwave Portable Wireless Bluetooth Speaker with NFC weighs just 2.2 pounds and is 11.57 L x 6.1 W x 5.16 H making it about the length of a sheet of paper and has a triangular shape. The built in Lithium Ion battery provides up to 12 hours of play time and also has a built in microphone to allow hands free calling. Power and volume controls on the top make it easy to operate. 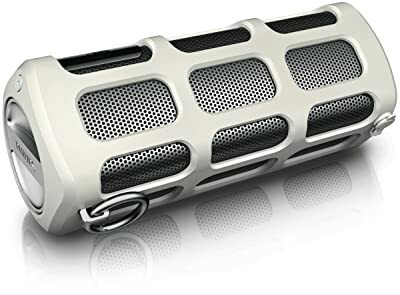 This portable speaker offers Bluetooth connectivity, auxiliary port to plug in any MP3 player and easy pairing using the power of NFC. This small (11.57 x 6.1 x 5.16) packs a lot of sound from its 3″ full range drivers and offers complete hands free playback and pairing. The Creative Airway Portable Wireless Bluetooth Speaker with NFC is a great speaker for those looking for a good sounding portable sound that also has plenty of battery power. This is the perfect companion for poolside entertainment, camping or any other outdoor events where mobile sound is a necessity. For a fraction of the cost of some of it’s competitors and extra features like NFC single touch pairing, it is a must buy for sure. One of the drawbacks of a smartphone or tablet is the lack of acceptable sound quality. This is due to most devices having speakers that face away from the user. The StrongVolt POP360 Hands Free Bluetooth Speaker With 360 Degree Sound is an excellent solution to the issue. Included in the package is the StrongVolt POP360 speaker and a USB cable. The speaker contains a USB port for charging, a built in 3.5mm auxiliary cable for devices without Bluetooth, and a switch to change between Bluetooth and auxiliary. The StrongVolt POP360 comes ready to use out of the box. Simply press the top of the speaker to be greeted with a gentle voice saying, “power on.” From there, pair the device using Bluetooth and fill the room with sound. For devices without Bluetooth capability, the StrongVolt POP360 comes with a built in 3.5mm speaker cable. Using the cable requires nothing more than a flip of the switch from Bluetooth to auxiliary. The StrongVolt POP360 has about 4 hours of playback time via Bluetooth and 5 hours via auxiliary. Charging takes approximately 3 hours. With a transmission distance of 10m, the StrongVolt POP360 provides surprisingly big sound for being so compact. It may be small in size, but the SONOS PLAY:1 wireless speaker delivers big, full-bodied sound, anywhere in your home. The PLAY:1 will fit into the tightest places yet it will deliver streaming music in crystal clear, HiFi audio, without dropouts. You can even listen to your favorites while in the shower: the PLAY:1 was designed to resist humid environments. The custom-designed mid-woofer and twitter fill your home with crisp high- and mid-range notes, as well as booming bass. You get awesome, textured sound even at high volumes, with little distortion. The PLAY:1 is flexible enough to use as part of your home theater system. It will play your entire music library from any device, millions of songs from popular music services such as Pandora and Spotify, and audio from more than 100,000 free radio stations and podcasts on the Internet. Like all SONOS products, the PLAY:1 is well built and made to grow as your needs grow. 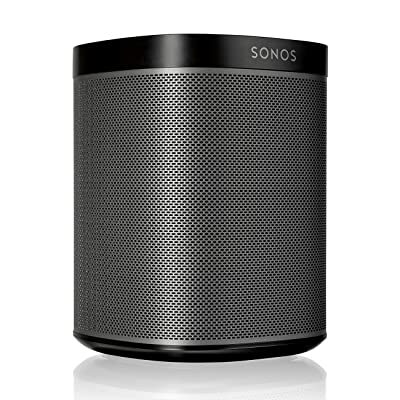 You can add another PLAY:1 or other SONOS speakers to your wireless HiFi system, or use the PLAY:1 by itself. Either way, you’ll be sure to enjoy incredible sounds in a compact, versatile package. TDK Life on Record A33 Wireless Weatherproof Speaker is rugged and is made for easy portability. This speaker comes with a rechargeable battery that lasts up to six continuous hours of music. Listen to your music from any where like your boat or even your kitchen cabinet while doing housework. It is supported by your Bluetooth device and you can use any other device including your tablet or laptops. This waterproof speaker is backed by a one year warranty and weighs in under three pounds. This speaker offers authentic distortion free sounds and adds richness and authentic bass sounds. This speaker also comes with a built in microphone for you to take your calls. You will be happy with your purchase of this speaker, the consumer have rated it four and half out of five stars. This product is also certified and inducted by Apple, which is made for the iPad and iPhone (MFI) programs. 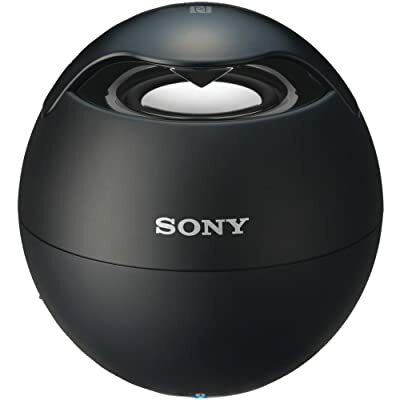 This Sony speaker system that comes in black (along with other colors) only weighs 4.8 ounces (.70 lbs) and has a very modern look. The round design delivers a rich sound because of the special diffuser arrangement. There is also speakerphone capability so that with a simple push of a button, you don’t miss a call and can talk hands-free. Near Field Communications (NFC) means it is extremely easy to connect a device with one touch, and start streaming right away. The system will last up to five hours on one Lithium ion battery (included) which can be easily recharged via USB cable. A mini-USB cord is included in the purchase. A few last added bonus’ is an auxiliary cable that is used for any non-Bluetooth audio devices, and a carry bag to make it even simpler to bring the sound system with you anywhere. 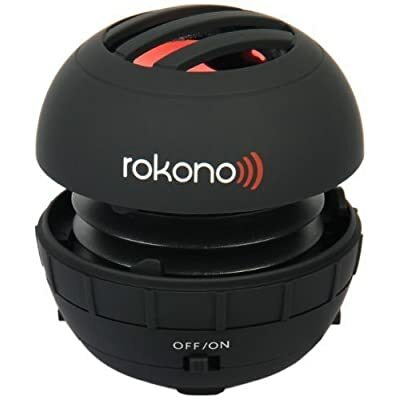 This little sound system is perfect for small gatherings outside, or when you travel a lot but still want to listen to all your favorite songs. Sony has always been an awesome company concerning sound and technology; and they don’t waver with this one. The iLuv Syren is a powerhouse portable speaker in a smooth compact design. The unit is intended for those who love to have access to their music while on the move. Enjoy music in a wide range of areas with the Syren’s Bluetooth streaming capabilities. The unit also has NFC technology, which provides the device with the easy one touch technology. The 360 degree sound is one of the strengths of the speakers, providing the speaker with full range capabilities and enhanced bass. The built in mic and speakerphone are also an excellent way to speak with friends and family through hands free calls. iLuv’s Syren is among the least expensive and a bit larger compared than other units within the same price range. In addition, the unique design does an excellent job of producing excellent sound within a small area. However, the Syren is mainly designed to be used with portable devices such as iPhones and MP3s, which maybe a drawback to some users. Philips ShoqBox SB7210/37 Blue tooth Wireless Speaker (White) is a speaker that will work with just about any device you have. Devices like a blue tooth compatible smart phone or a MP3 player. This speaker is not only durable and portable but also is shock and splash proof. The battery is an eight hour litium ion battery and lasts up to eight hours, and is included with your purchase. The speaker’s technology can reproduce identical bass that bigger speakers produce. The consumers have rated this speaker with three and a half stars out of five. This speaker will make any party sound like they are at a concert. It also comes with a smart sensor that you can use to go forward or backwards to find your favorite songs. 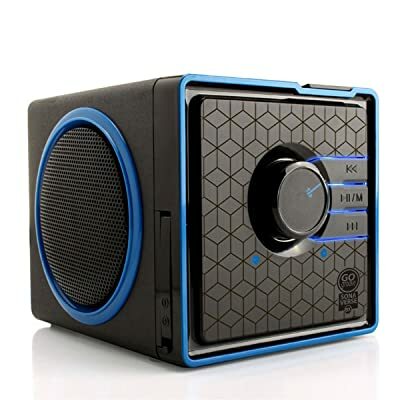 This compact speaker only weighs two pounds, its light weight makes it portable and you can carry it around any where. Sometimes when you are on the go, portable speakers are a must. It is important that these speakers are loud. Whether they are being used for a rocking party, or a stirring speech, the speakers need to be heard. Unfortunately, loud speakers are not always associated with quality sound, but with today’s technology it is possible to be heard and sound great. If you want to take your show on the road, then this is the perfect portable speaker for you. Designed more for traveling musicians or for larger events, this PA system makes sure you are heard. Not only does this system easily hook up to any blue tooth device, it also has a 1/8″ auxiliary input so any non blue tooth product can be amplified. The amazingly loud speakers sound can carry up to 150 feet, and the recessed wheels make it surprisingly easy to transport. If you want to make a statement and be heard, then these are the speakers for you. First of all the name of these portable speakers is cute, but these sleek, and elegantly designed speakers pack a punch. Extremely loud, these water proof and stain resistant speakers can go everywhere. The long battery life makes them perfect for any event, indoors and out. Easily hook up to eight Bluetooth products at a time, so there is never a quiet moment at your next party. The only downside to the loud, portable speakers is the higher price attached to them, and minor complaints regarding the quality of bass coming from them. If a bigger speaker is what you are looking for, along with being one the loudest portable speakers, the TDK wireless and weatherproof speaker is for you. These speakers come with a small sub woofer and 9 watt amp, providing plenty of ground shaking music for any party. These speakers are extremely popular at pool parties also, their tough, splash proof design makes them almost indestructible. The speakers hook easily to any blue tooth device, and also work as a speaker. For great, loud sound, these speakers are great, the only downside to these speakers being that their larger size makes them heavier than other portable speakers. Finding the loudest portable speakers does not mean having to give up quality of sound. With today’s high quality portable speakers, it is possible to have both. Whether these speakers are for a speech, or for a rocking party, you are sure to be heard. It’s easier to find suitable portable speakers for your mobile device when you know what kinds of features are available. If you’ve never shopped for the best bluetooth speakers before, you could miss out on something that would be absolutely perfect for you. It definitely pays to be an informed shopper. By doing your homework, you’ll be able to find speakers that you can depend on for a long time to come. You use a mobile device to avoid being tethered down, so shouldn’t your speakers be wireless too? Some of the best portable speakers rely on Bluetooth technology for fast, first-rate wireless connectivity. The vast majority of popular mobile devices are compatible with Bluetooth, so you should be good to go. For extra flexibility, however, you might want to invest in portable speakers that can also be connected with a wire. These typically have auxiliary-in, 3.5-mm jacks. Like most people, you’ll probably keep your mobile device close to your portable speakers while using them. Still, what if you want to do a little wandering around? You shouldn’t be forced to stay right near the speakers to listen to music, so make sure to check the wireless range of any speakers that you consider. Wireless ranges vary considerably. Some models, like the Photive CYREN, boast ranges of more than 33 feet. Others have more limited ranges, so be sure to read the fine print. Wireless, the best Bluetooth speakers are powered by batteries. Most of today’s top-selling portable speakers have lithium-ion batteries, which are prized for their ability to hold charges for long periods of time. Still, there is a wide range in terms of how long these speakers can go before needing to be recharged. The JLB Flip, for instance, only has a battery life of about five hours. The Jawbone JAMBOX, on the other hand, can go up to 15 hours before needing to be recharged. It also pays to find out how the battery in a set of portable speakers is recharged. You won’t have to worry about buying new batteries all the time, but you can expect to have to plug in your speakers periodically to keep them charged. Many models, including the HDMX Jam Classic, are recharged using USB cables that connect to wall adapters or computers. Others, like the Bose Mini Bluetooth Speaker, recharge on cradles. Some speakers can be used while they’re recharging, which is a nice perk. What’s the point in using portable speakers with your mobile device if the sound quality isn’t very good? There’s a wide range out there in terms of audio quality. If it’s important to you, be sure to look for features like 360-degree sound output, high-quality acoustic drivers, passive bass radiators and digital signal processing. The X-mini portable speaker and some other models expand to create audio resonance chambers that amplify sound even more and produce crisp, clear audio that you’re sure to love. The last thing you’re going to want to do is lug around a heavy, cumbersome set of speakers. Just because something is marketed as being portable doesn’t mean it’s definitely easy to take from place to place, so always look at the weight and dimensions of a speaker set before buying it. The Oontz Angle has a very low profile and weighs in at just nine ounces. Meanwhile, the Bose SoundLink weighs around 1.5 pounds. 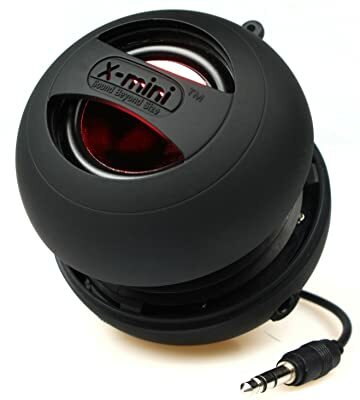 Capsule speakers like the X-mini are especially portable. Other models, including the iHome iHM60GY, are collapsible. Many of the portable speakers that you’ll find on the market today come with cases and covers that can be used to keep them safe while they’re carried from place to place. As with anything, the quality of these covers and cases varies considerably. Some models come with simple pouches that don’t offer a whole lot of protection while others come with sturdy, durable cases that keep them safe while they’re being transported. The Bose SoundLink Mobile Speaker 2 has a snazzy cover that doubles as a stand, which is a nice thing to have. Higher-end portable speakers feature some pretty advanced technologies. Many of them can display information on smartphones, tablets and other devices, and this makes them even more useful. As with any type of mobile technology, such speakers sometimes have glitches that need to be corrected, so software updates are occasionally released. The nice thing is that these updates sometimes include new features that make speakers even more useful. Updates are usually made by plugging the device into a computer with an Internet connection and following the on-screen instructions. Once you’ve connected your portable speakers to the device of your choice, you can start enjoying the perks of listening to music without headphones. You can avoid the hassle of having to reconnect every time you want to use your speakers by choosing a model that has device memorization. Bose portable speakers are able to memorize up to six devices. Whenever such devices are detected when the speakers are on, they are able to connect automatically. Most of the best speakers are pretty minimalistic in terms of controls. That’s mostly because you do most of the controlling via your mobile device. However, some models have controls right on the speakers, which allows you to turn up the volume and pause or play music without having to use your mobile device. Some controls are more intuitive than others. It’s generally best to stick with portable speakers with very simple controls because there will be a lot less confusion in the long run. If you want to get the most bang for your buck when using today’s portable speakers with your mobile device, be sure to get a set that has an auxiliary port. The most common port of this kind is the 3.5-mm port. It’s convenient because it can then be used to connect other devices to the speakers with a wire. Most smartphones and tablets have 3.5-mm jacks, so they should be compatible. 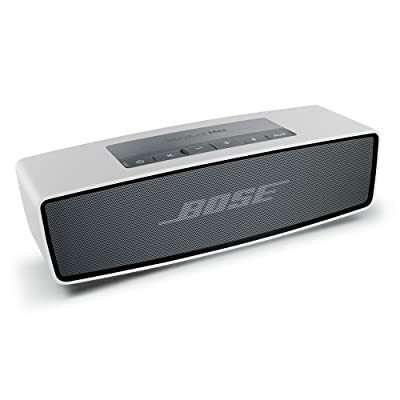 Models like the Bose SoundLink Mini Bluetooth Speaker even allow you to connect to one device wirelessly and to another with the auxiliary port, and you can then easily switch between them. What kind of budget do you have in mind for your portable speakers? These days, you can spend a lot of money on them, or you can spend very little. The good news is that you can get away with spending as little as $20 or $30 and still end up with a nice set of portable speakers. You’ll get more advanced features by spending more money, and some models cost upwards of $300. If you’re willing to splurge on a high-end set of portable speakers like the Bose SoundLink, one should suffice. There are much less expensive models out there, but they may not deliver quite as much volume as you’d like. There are modular models out there that can be connected together to be louder and clearer. They are especially handy for situations like loud parties and outdoor use. The Kinivo ZX100 has this capability; the X-mini does as well. It’s kind of fun to link together several devices and create a “wall” of sound. Get even more use out of your portable speakers by choosing a set that has a built-in mic. You’ll find this handy feature on models like the Bose SoundLink Mini Bluetooth Speaker and the Oontz Angle. The great thing about it is that when a call comes in, the music is paused. You can then take the call as you would on a speakerphone. The JBL Flip has a call-answer button that puts you in complete control. If you’re going to connect a smartphone to portable speakers, this is a great feature to have. You have all kinds of options when it comes to the design of your portable speakers. Some models, like the Oontz Angle, are triangular in shape, which lends them a lot of sturdiness. Others, like the JBL Flip, are designed to be used vertically or horizontally. Many models are available in a huge array of colors. 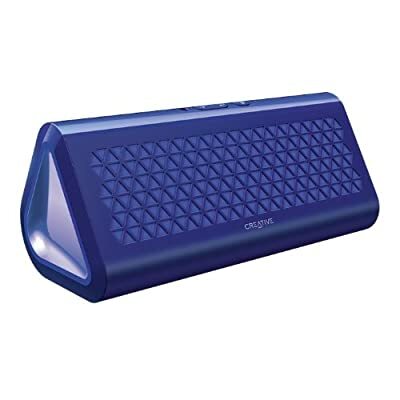 If the appearance of your speakers is really important to you, you should consider the Jawbone JAMBOX. You can design your own by choosing from different grill colors, grill designs and caps. Nothing is worse than having your portable speakers suddenly stop working out of the blue. This usually occurs when the battery dies. Many models have indicator lights build right into them so you can keep an eye on battery life. The JBL Flip, for instance, has an LED battery indicator. On other models, like the Photive CYREN, play an alert when the battery is low. Still others, like the Jawbone JAMBOX, display the battery life on the screen of the device that’s being used. Bluetooth is a kind of wireless technology that allows the transfer of audio and data signals over short distances. Many Bluetooth devices have the capability to communicate with more than one Bluetooth transceiver at a single time. This helps give them a unique advantage over other kinds of wireless technologies that need separate transceivers for every device. Many people also considered Bluetooth technology to be one of the great adaptors and survivors of the technological world. This is because it has defied predictions of looming irrelevance every year by remaining an integral part of today’s high-tech devices. The proliferation of wireless technologies such as Wi-Fi and Bluetooth has ultimately given consumers the capability to receive wireless digital audio whether they are on the move or at home. They do this by streaming audio, listening with wireless headphones and connecting a transmitter dongle to a mobile audio device. However, what makes Bluetooth unique from Wi-Fi is that it is more personal and does not need a central router to help manage communication. Because of this, the vast electronic market is filled with opportunities for this technology. This is due to the constant demand for devices that people can use anywhere and any time they want. Many people consider Bluetooth technology to be a thread that links diverse electronic products together. This lets consumers skip the need for wires with a growing number of electronic devices that they use every day. The promise of simplicity and always being on-the-go are powerful tools that help companies sell Bluetooth devices. Similar to its influence on the manufacture of mobile phones, Bluetooth technology is making waves in the speaker industry. A wireless Bluetooth speaker gives people the opportunity to listen to music without the need for any physical connections. Moreover, a portable Bluetooth speaker can be taken anywhere people want to go. At the same time, these speakers contain a built-in rechargeable battery that makes them more portable than their wired counterparts. They also require no fixed infrastructure as it is a new type of technology that is easy to set up and install. Another unique feature of this technology is that it has obvious advantages in speed when compared with other modes of communication. Bluetooth speed can reach a maximum of 24 Mbps. This is much faster than the speed found in traditional wire bound speakers. Due to their numerous merits, portable Bluetooth speakers have extensive applications today. The evolution of Bluetooth wireless technology started with the Swedish mobile firm Ericsson in 1996. However, it was not originally directed at the consumer market but rather at developers. Since then, Bluetooth has become one of the foremost people-oriented wireless technologies. This also helped the technology drive further developments in the electronics industry. Bluetooth’s popularity has often determined the direction of its evolution. Despite already being popular, many manufacturers have plans to increase the data rates for this wireless technology. This will foster greater usage with a steadily increasing array of multimedia applications. It also represents manufacturers’ efforts to keep pace with the latest developments in other fields of technology. The Bluetooth version 2.0 technology features backward compatibility with version 1.2. 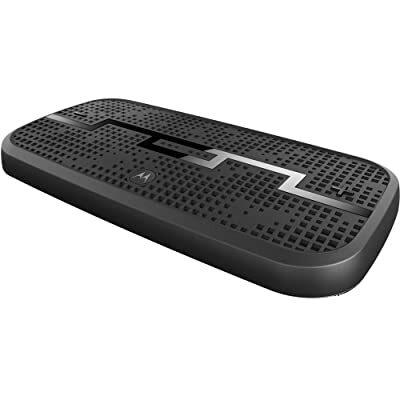 This ensures that any previous generation accessories will work with newer devices. Version 2.0 also introduced an optional feature called the Enhanced Data Rate in addition to minor fixes. This feature allows hardware to transmit data at a much faster speed for devices that are listed as Bluetooth EDR 2.0+ compatible. Bluetooth 2.1 followed after a short while. This upgraded version has additional features such as Secure Simple Pairing. Secure simple Pairing helps improve data transmission security and accessory connection speeds. Another feature called Extended Inquiry Response provides additional hardware data during the connection process. Although the Bluetooth version 2.0 has state-of the-art capabilities in reproducing quality streaming sound, version 2.1 degraded the audio quality of streamed Bluetooth music. Bluetooth 3.0 introduced an optional High Speed feature to the market. This allows for data transfer rates up to a maximum of 24 megabytes every second. Devices that are listed as Bluetooth +HS 3.0 achieve this much faster transfer rate through the use of wireless networking technology. The initial connection between accessories and other devices happens using this Bluetooth specification where data is transferred though the use of an 802.11 wireless network signal. The majority of Bluetooth 3.0 enhancements are implementing this feature along with additions to its technological specifications. These important additions include Alternate PHY / MAC that allows Bluetooth devices to change from one data mode to another and an enhanced power control that helps devices effectively switch between 802.11 modes and Bluetooth. Many people said that Bluetooth audio quality is inferior to conventional auxiliary cables. However, this is not the case with Bluetooth 3.0 because manufacturers have fixed the defects found in 2.1. At the same time, this version has much faster capabilities to reproduce quality streaming sound. This Bluetooth version includes HS and the classic Bluetooth protocols as part of its technological specifications. This helps achieve a high level of compatibility with accessories and devices. At the same time, it also introduced a low-energy protocol that is entirely new in order to reduce power consumption and help extend battery life. Depending on the manufacturer along and the components used, a Bluetooth 4.0 device may utilize this low-energy protocol in conjunction with any lower-energy previous versions of Bluetooth or by itself. Due to its low power consumption, this version’s sound streaming reproduction is great. Aside from that, it has the latest aptX decoder that enables people to listen to high-quality music. With so many features, price points and options, it’s a snap to find the perfect pair of portable speakers. Now that you know a little about the best features, familiarize yourself with some of today’s most popular models by reading our reviews.